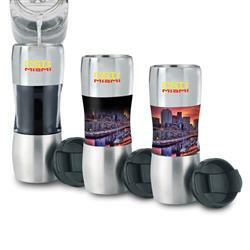 Santana Heat Activated Travel Mugs with your custom full color logo. 12 oz. Double walled stainless steel tumbler, clear acrylic window with your own custom designs using patented heat changing technology. 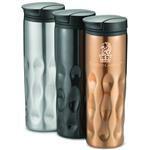 Dark when cold, with custom design revealed underneath when hot liquid is poured in. Screw on spill proof lid. BPA Free. 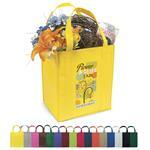 This is a fun unique promotional item in full color! Available Colors: Stainless Steel Exterior with Acrylic Window and Full Color Image of your choice. Dimensions: 8.5" H x 3" D. 12 oz. 3.75" H x 6.65" W (center). 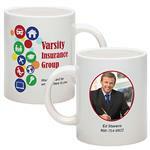 Available Imprint Options: Full Color Heat Activated Imprint. Screen Print or Etch on Top Panel Available - Inquire. Custom Double Wall 12 oz. 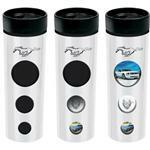 Stainless Steel Travel Mug with Full Color Heat Activated Imprint. Carton Dimensions : 15 x 12 x 26.